You know what they say – you have to love yourself before anyone else can. Finding a killer red lip might be a bit on the superficial side, but it’s a step in the right direction, right? Illamasqua’s 2014 Valentine’s Day offering, the I’m The One Collection*, is definitely a good place to start your search. I’m The One is a capsule collection of four different products, including two brand new ones, in sensual scarlet hues. First up, a classic red Nail Varnish in the shade Throb (£14.50), which is one I already own and have featured in numerous nail posts but it’s probably most prevalent in this one. 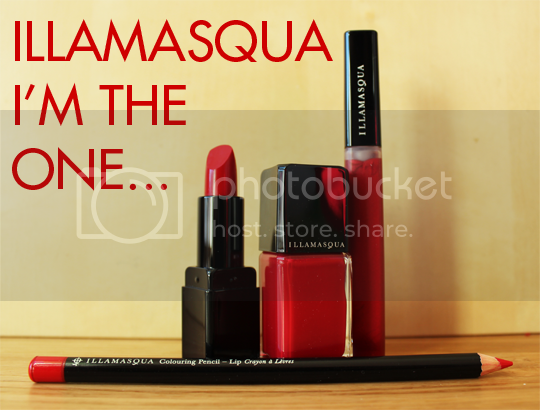 Literally every woman requires a pillarbox red cream polish in her stash, and Illamasqua’s formula is second to none. The three remaining I’m The One products are a terrific triptych for creating the perfect red lip. Red is the one lip colour for which I believe lipliner is an absolute MUST, so new Colouring Pencil in Feisty (£14.00) is where you should start. Keep this creamy pencil nice and sharp for precise lining of the lips, especially in the corners and around the cupids bow where precision is key, and use it at an angle to fill in the entire lip to complete the base. Next up – the filling of your red lip sandwich – is of course the Lipstick in Maneater (£16.50). A frequent observation of Illamasqua’s lipsticks is that they can be quite drying, but I find Maneater to be one of the better shades in that respect. Particularly with the creamy base of Feisty Colouring Pencil, and a good slick of lip balm beforehand, you shouldn’t encounter any drastic dryness problems. Best results with Maneater will be achieved by applying with a lip brush (and of course, Illamasqua do a great one for £18.50), but if you’ve the patience of a saint you can certainly get away with applying straight from the bullet. Apply two coats, blotting with a tissue in between, for ultimate staying power. As you can see above, wearing the pencil and lipstick together is all very well and good. However the piece de resistance of I’m The One comes in the guise of new Intense Lipgloss in Touch (£14.50). This plush and pigmented gloss is infused with a beautiful sparkle that just adds that little extra somethin’-somethin’ to your red lip look and takes it to a whole new dimension. The formula of the Intense Lipglosses has greatly improved over the last few years, still offering the same high colour payoff but far less sticky now which makes them a winner in my book. Rocking the I’m The One look would cost £59.50 if you were to buy each piece individually. If you need to add some scarlet shades to your stash and are interested in all four pieces, you can get the whole collection in one go for £50. Will you be investing in these staple shades? Oh, and by the way, if you tweet or instagram a red lipstick selfie mentioning @illamasqua and the #ImTheOne hashtag between now and 15th Feb 2014, you could be in with a daily chance of winning pieces from the I’m The One collection and, with any luck, be featured on Illamasqua.com.